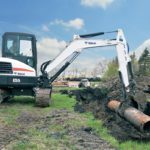 This model shares the main design approach of the new excavator generation that started with the E32 and E35, followed by the E45 and E50 with tremendous success. 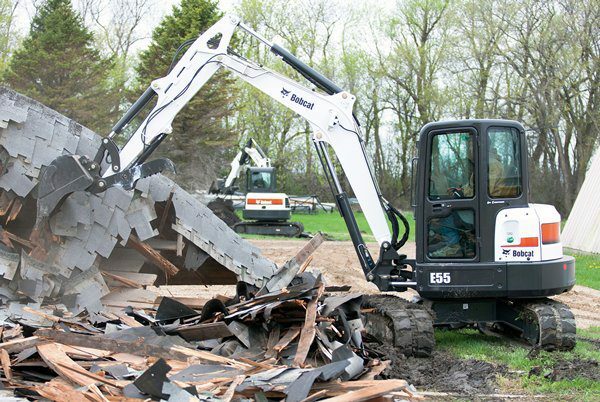 They set the standard in the compact excavator industry with respect to reliability, operator comfort, smooth workgroup control and superior hydraulic performance. The E55 offers numerous advantages and new technologies that are the state-of-the-art in this market. 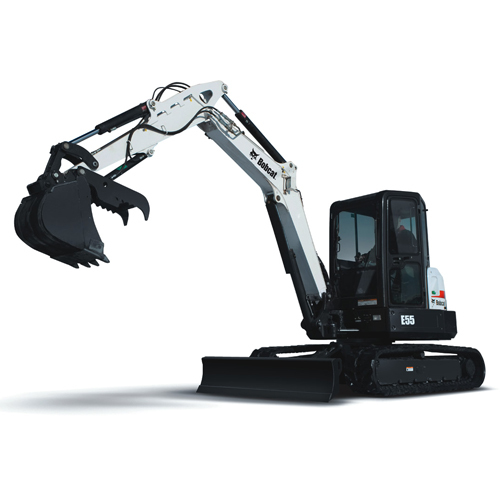 The main idea of the E55 excavator design was to create an excavator with the best in class stability and lifting capacity and at the same time keep all the excellent characteristics of the E45 and E50 excavators. With the big counterweight and the conventional tail design the E55 offers more swing torque to swing a full bucket in the extended position, allowing the excavator to work efficiently both on slopes and on level ground. 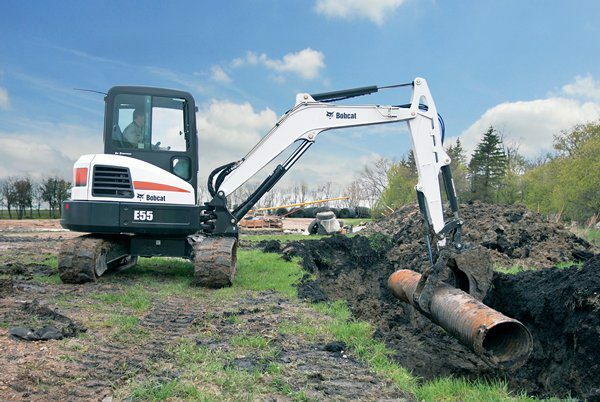 The reliability of a compact excavator contributes to its lifelong operating cost. 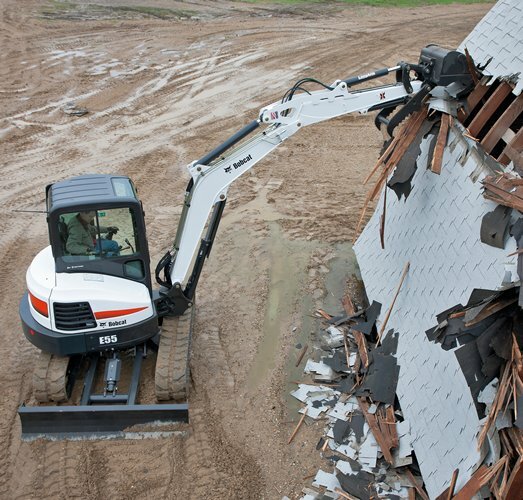 Bobcat uses computer-assisted design techniques, highly durable materials and structures which are endurance-tested under extreme conditions. The boom and dipperstick structure of the E55 is an evolution of the one used on the E50 (the improvements in the design are also applied on the E50). The new design provides longer life, utilizing a 4-plate structure with internal gussets and welds. It optimizes the weight, yet provides a stronger, more durable and reliable structure. This contributes to increased lift capacity and smooth machine operation. Improvements made on most of the hydraulic components, connections and routing as well as increased use of sub-assembly production lines reduce the risk of hydraulic leaks and increase quality and reliability levels. The new load-sensing piston pump and the closed-centre control valve create a hydraulic system that delivers an exceptional metering for smooth control of all machine functions, while reducing “hydraulic noise”. 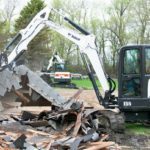 Cushioned boom and dipperstick cylinders provide a smooth end-of-stroke, resulting in a “calmer”, “quieter” but very efficient and productive compact excavator. The E55 also features an improved boom swing control like the E45 and E50. The boom swing is controlled by a thumb wheel located on the left joystick, instead of the pedal control used on many competitive machines of this size. This feature offers the benefit of improved controllability (metering) of the boom swing function while creating more floor space for the operator. 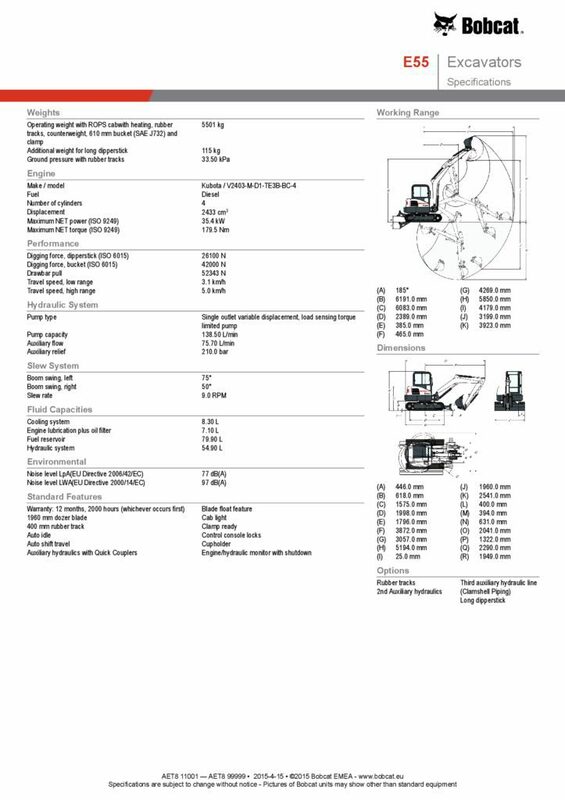 Another feature, new on the Bobcat E55, is the auto-shift travel motor. The auto-shift feature allows an automatic transition of speeds. On the E55, the operator can disengage the auto-shift and still use the switch on the blade control lever. The cab was designed according to the latest comfort, visibility and space standards. It not only offers ample foot and leg room but also an extremely comfortable work environment. The cab is equipped as standard with radio/MP3 ready installation and air conditioning as an option. In order to save fuel, reduce noise and create a more comfortable environment, the E55 is standard equipped with “auto-idle”. The auto-idle, which can be activated at the operator’s discretion, automatically causes the engine to drop to idle if the excavator functions are not used for a period of 4 seconds. The machine immediately returns to the pre-set throttle position when the operator starts movement of the machine again (joystick movement or travel function).